– Before you start cooking up a storm, there are a few things that you will need to get started. I purchased my Calphalon Signature™ Stainless Steel at Macy’s the other week (you can find both Stainless Steel and Nonstick online here), and I am obsessed with it! I use Calphalon for my cookware whenever I get a chance because of their amazing full lifetime warranty on all Calphalon Signature™ items. This omelet pan is absolutely perfect for all my needs – it is huge, so I never have to worry about squeezing in my food, and it is also stove and oven safe! The triple layer aluminum core is fused between stainless steel which makes it not only beautiful, but also durable, dishwasher and oven safe, and suitable for all cooktops! This was a huge deal to me because you need a pan that can go in the oven for my Dutch Baby recipe (you can find the recipe below). I definitely recommend getting one for yourself. 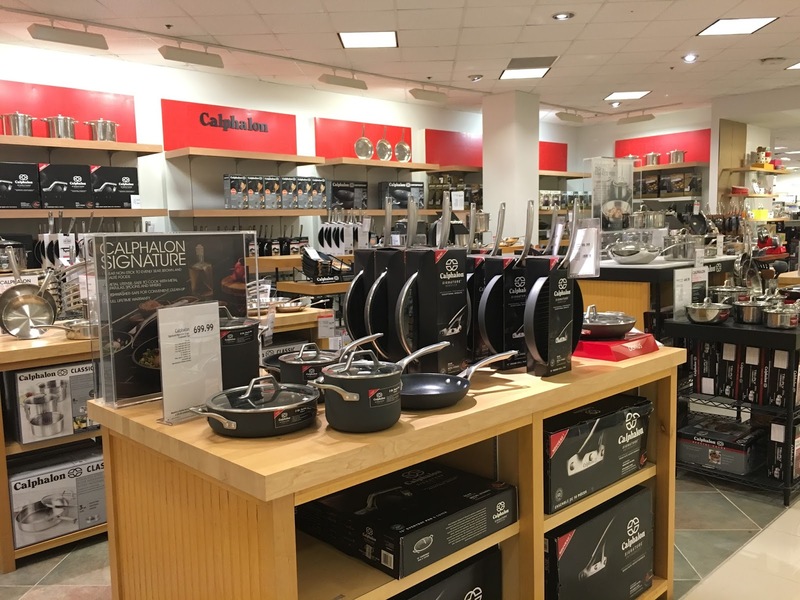 Look at the cute Calphalon section in Macy’s! Have you ever tried to hold a plate, fork, spoon, knife, napkin, and drink in your hands while in bed eating? It is a hard task! Grab a breakfast tray, or huge platter so that it is stress-free and less messy. This is not a necessity, but what is more romantic than flowers when you first wake up in the morning?! Small details make all the difference in the world! You don’t want to forget these! Make sure to use high quality ingredients. – Plan out your menu, and write down your ingredients in advance! This is an extremely important tip because you do not want to be stressed the morning of, or night before shopping for all of your ingredients! Planning out your menu will help you get organized before your breakfast, and writing down your ingredients will help you shop with ease. The most stressful thing would be to forget an ingredient and have half of your breakfast finished before you realize it! Staying organized is the key to success!!! Make sure the time and day that you pick works for both of you! 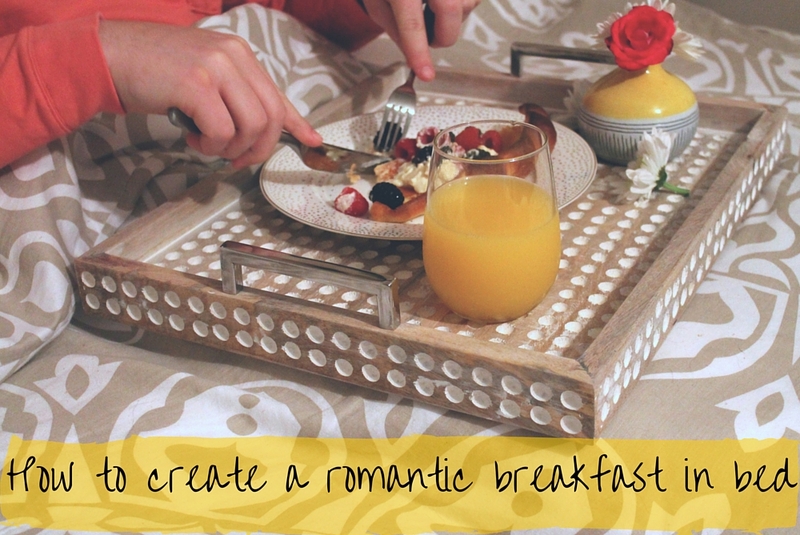 If your partner has a busy morning, it probably isn’t the best time to pull off a romantic breakfast because he/she will be stressed out. I would suggest picking a relaxing weekend, or a day where you know that you have a few hours together in the morning so that it is stress-free and relaxing. Light a few candles and turn on some soft music. Make sure the music comes last, or else you will wake up your partner! If they do wake up, make sure to have a magazine, or newspaper ready to go so they can read while they wait. Details are everything! 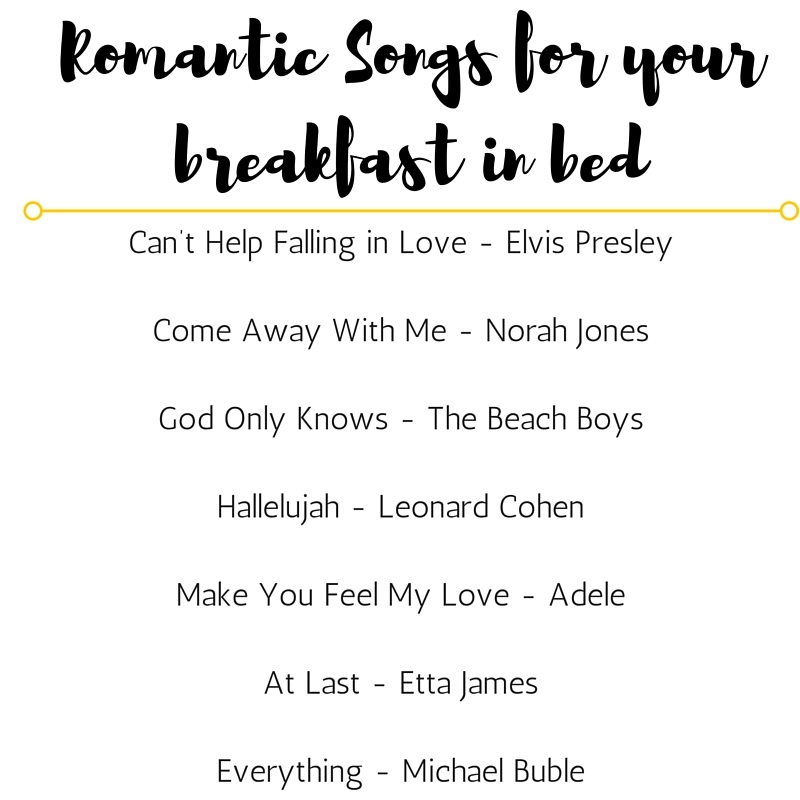 Don’t know any romantic songs? No worries – I’ve created a short list for you below! Make sure to make this breakfast in bed about them! If you know what their favorite flowers are, get them. If you know they hate eggs (even if you love them), skip them. This is for them, so make it perfect and catered to what they love. Below, I am sharing with you the recipe that I made for our breakfast in bed. If you are looking for a high quality, impressive dish for a breakfast in bed, or even for a brunch with guests, this is the perfect dish! – Pour your batter into the pan, and place back in the oven for about 20 minutes (check it around 15 minutes). – When your dutch baby is finished cooking, take it out & add your mascarpone on top along with your berries. You can either place your mascarpone in the center, or sprinkle clumps around the entire dutch baby. Have you ever had a breakfast in bed? Don’t forget to use high quality ingredients, add tons of small details & cook with quality cookware, like my Calphalon Signature™ Stainless Steel Omelet Pan to make your gourmet meal!